First Come First Serve is for Bus Stops !! Any experienced professional will be able to tell you that any proposal for a business initiative consists of two parts – Technical ability and Financial proposal. This is true in Private sector and government; for purchases of goods, services and projects. The defense of Mr Raja for his deeds was a desire to introduce higher competition in the Indian Telecom market. This itself is a bit debatable. There were 8 players in the industry in 2007. By introducing hyper-competition, he has changed the business rules for all the operators (in 2007) overnight. Lets ignore this aspect, and move on to the process of introduction of new players. Can a First Come First Served process give results here? Are moneybags and speed the only requirements for the new licenses? This is the work of novices. The right way is to invite technical and financial bids from corporates (and joint venture partners) who wish to enter this business. Here if you want to favour Indian firms, the right way is to set the conditions that the primary partner is Indian, and the JV must commit to have a certain 76:24 (for example) maximum partnership, and invite bids in a proper timeframe. This aspect has been messed up and not understood by government authorities. When the subject of ‘opening up Indian skies’ came up, the government in its wisdom actually disqualified applicant firms that had foreign airlines as partners. A case of shooting yourself in the foot. All this when the biggest mess is at the government’s Air India itself. But I digress from the telecom sector. Once the FCFS rule was in place, and the cost of licenses is so low, how do you control the number of applicants? The whole SC pronouncement is based around the arbitrary method and cut off dates chosen by Raja. The right way to decide is a transparent evaluation of Technical & Financial bids. By experts. So that the bid winners are chosen on the basis of some merit and a better financial offer. There are multiple parties to this SC judgement. The government (Ministers + telecom department), the TRAI and Telecom commission, the mobile operators, and consumers. How will justice prevail across all these parties? Consumers may not be much affected. They can stay if their operator survives, or use MNP to switch. The biggest losers are the operators, and their MNC partners. Some of these took advantage of the licenses and sold it/ brought in MNC partners at huge valuations/ profits to themselves. There were no restrictions on this. Thereafter the firms may have made large investments to roll out the networks. In the interest of business stability, these different entities need to be dealt with separately. Current players who have made investments must be given priority for new licenses. The Ministers/ government/ TRAI and DOT have egg on their faces for creating this problem. The New Telecom Policy should be able to provide a stable governance for this vitally important sector. By not staying on top of a rapidly evolving and important sector, the government has displayed incompetence, arbitrariness, partiality, opaque decisions and at best naivete in governance. At worst outright corruption. And First Come First Serve is for bus stops and restaurants. Not industry !! The second largest telecom market in the world might just have the most incompetent administrators. Time for a big correction here. In terms of the stock market effect of this scam, the only listed firms are Bharti Airtel, Idea, Reliance Comm, Tata Comm and MTNL. The sector has underperformed in the last one year, see Figure 1. The dust will take months to settle now. There will be exits (likely Telenor), counter litigation (likely older operators of Idea and Tata) and withdrawal of additional FDI. 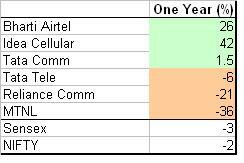 As an Investor, I had predicted that Bharti Airtel will be least affected by the regulatory uncertainty. LINK. Investors are advised to stay with this stock. Do you find this site useful? Please comment below. And subscribe for new posts by filling the ‘Sign me up’ box on top right of this page.